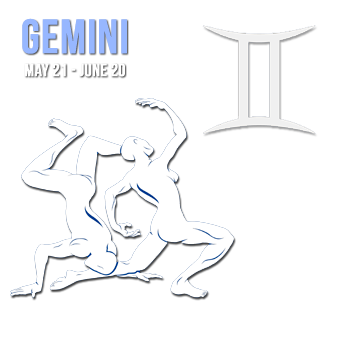 Gemini is versatile, dual-natured, elusive, complex and contradictory. If you want someone who is of two (or more) minds, then you want a person born under this sign! But along with that versatility come the vices of two-facedness and flightiness. The sign is linked with Mercury, the planet of childhood and youth, and its subjects tend to have the graces and faults of the young. New activities are entered into enthusiastically but Gemini lacks application, constantly needing new interests, flitting from project to project as apparently purposelessly as a butterfly dancing from flower to flower. To them life is a game always full of fresh moves and continuously entertaining, free of labor and routine. Changing horses in mid-stream is another small quirk in the Gemini personality which makes decision making, and sticking to a decision, particularly hard for them. Most Gemini have a keen, intuitive often brilliant intelligence and adore intellectual challenges. But their concentration, though intense, doesn't last. Their mental agility and energy give them a insatiable appetite for knowledge from youth onward, though they are lazy when it comes to learning. They easily grasp just about anything requiring intelligence and mental dexterity, and are able to marry manual skills to their qualities of mind. They are one of the most analytical signs and sometimes it gives them a fantastic ability to see both sides of a question so that they tend to vacillate finding it hard to make decisions. Their intellect may be used to control and unify the duality of their natures into an extremely efficient unit. If faced with difficulties, they have little determination to worry about a problem until they find a solution - they will pick the brains of others instead. In their intellectual pursuits, as in other areas of their lives, they risk becoming dilettantes, losing themselves in too many projects which they follow until they become difficult. Because of Gemini's basic inconsistency of their emotional nature, can be fickle (but not intentionally). They may seem, because of this trait to be amoral. Standing back from becoming deeply emotionally involved is possible for this individual � sometimes hostile to sentimentality, sometimes laughing at it � while doing a deep intellectual analysis of the situation. You will find a Gemini lover to be intensely involved only while everything is new. They can be superficial, light-hearted, cool, flirtatious and unimaginative in understanding the pain they may give others. Liking intrigue, the excitement of the chase, once they have caught the object of their pursuit, they lose interest and look around for the next quest. In less serious situations they make witty, entertaining companions, good acquaintances rather than friends. Even at their worst they are never dull - there is usually playfulness below the surface, and they can be brilliant conversationalists - but they can also be quarrelsome, boastful, liars and cheats. In life, Gemini's may be: debaters, diplomats (though in politics they are more interested in theory than practice), orators, preachers (brilliant rather than profound), teachers, authors, poets, journalists, or lawyers. In business any work which combines quick-wittedness with a change of surroundings suits them; working as a traveling salesperson, brokerage work, or dealing with the public in any capacity is right up their alley. Because they are dispassionate, logical, rational and analytical they make good scientists, especially in the fields of medicine and astronomy. They can also make excellent members of the Armed Forces, for they take danger no more seriously than anything else and can earn themselves a reputation for devotion to duty and heroic acts. In the arts they may excel in music, painting and sculpture. They make good psychic researchers of a skeptical kind. Negatively they can degenerate into confidence tricksters and thieves.